The weather has turned. There is no denying it—fall will be here soon. Most cool mornings you’ll find me in one of two places: sitting at my computer on the back porch with coffee in hand or in the kitchen baking something that perfumes the house with deliciousness. On those oppressively hot late summer days, I avoid turning on the oven. Baking is simply not an option, but as soon as the first 59° F morning hits, all I can think about is muffins, cakes, tarts, and cookies. I start to dream of all of the goodies I will make for the holidays. Consequently, I also vow every fall to continue my workout routine through the dark days of winter to justify enjoying the fruits of my labor. It’s so difficult to put down the muffin and go to the gym though. 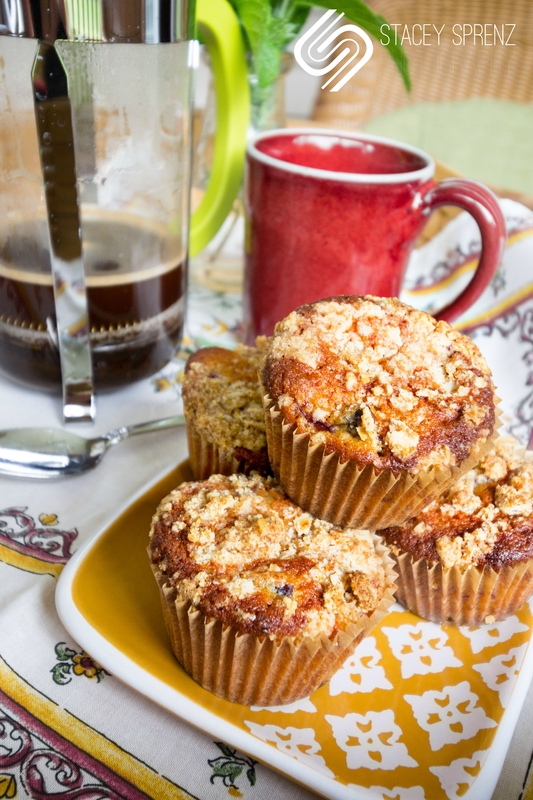 Muffins are one of my favorite cool morning baked goods because they can be enjoyed, still warm, for breakfast or as a late afternoon snack. Do you know the best use for those bags of raspberries, blackberries, blueberries, or cherries hiding in your freezer? Muffins. Most recipes follow a similar ingredient template and ratio of fruit to batter; so do not be afraid to change it up a bit. I rarely make a muffin without a crumble topping. That little bit of crunch on top adds texture, a bit of sweetness, and is the key to bakery-style muffins. Months ago, I lovingly pitted a whole bag of cherries and popped them in the freezer. I am waiting for the perfect fall morning to use them in this recipe. Perhaps I’ll even share with the neighbors, so I don’t feel tempted to eat them all. Cream butter and sugar together using paddle attachment on a mixer. Add eggs one at a time and stir to incorporate. Add milk, vanilla extract, and almond extract. Stir to combine. In separate bowl combine flour, almond flour, baking powder, and salt. Add the dry ingredients to the wet ingredients and mix to combine. Fold in the cherries. Use paper muffin cups or grease each muffin cup with butter. Fill each cup 2/3 full. Crumble Topping: Mix together flour, almond flour, brown sugar, and oats. Using a pastry blender or a fork, mix in cold butter until the mixture resembles wet sand. 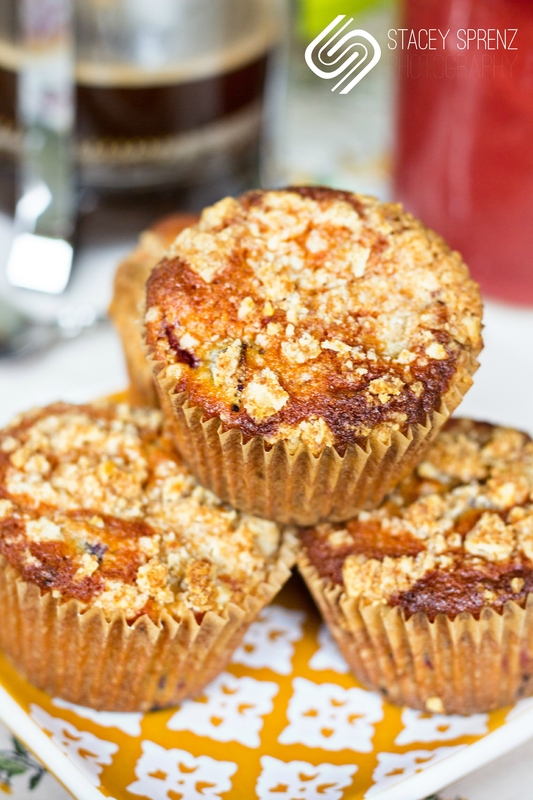 Top each muffin with the crumble topping. 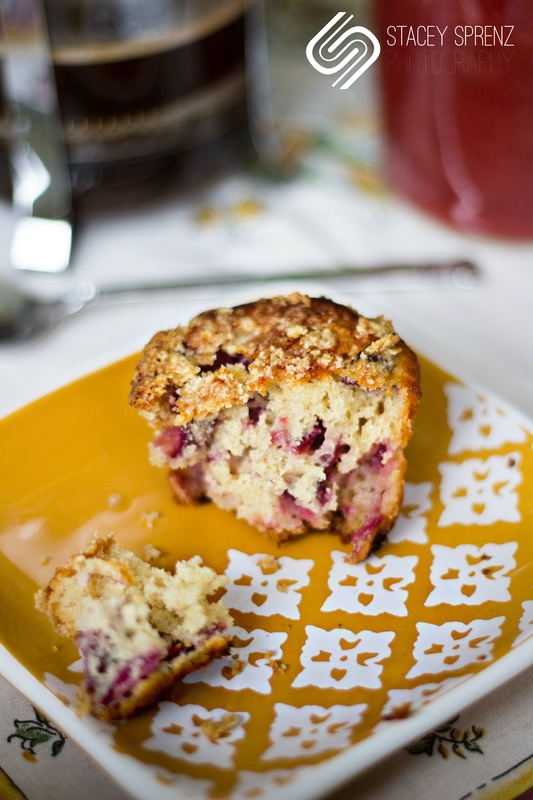 *To make larger crumbles, squeeze mixture in your hand and lightly crumble over the top of the muffin batter. Bake for 30 minutes or until muffins are golden brown and a cake tester inserted in the middle comes out clean.